ROCÍO CHICO 2019 TRANSFER OF THE VIRGIN OF THE ROCÍO: The transfer of the Virgen del Rocío to her village of Almonte, known as Rocío Chico, takes place on 19 August 2019. It is a tradition that celebrates only every 7 years. The village of Rocío is three leagues from the town of Almonte. After the transfer the Virgin will remain in Almonte for nine months, just two weeks before the Rocío pilgrimage in 2020. On Monday 19 August 2019 in the afternoon the Virgin leaves in procession through the streets of the village of Rocio, is the expected jump of the fence. Around 20:00 hours in the afternoon the virgin walks the path of the plains covered with the veil, to protect it from dust. She travels all the way during the whole dawn. Around 06:00 the Virgin arrives at the Chaparral, where she is left on a large altar. When the first ray of the sun comes out (although it is still dark), the Virgin’s maidens removed her veil. Then, at around 7 or 8 in the morning, the procession begins again to the Parish of Almonte. The image of the White Dove arrives in Almonte amidst the cheers and jubilation. 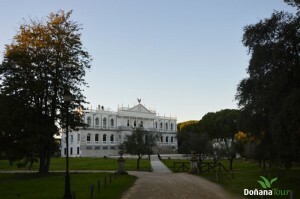 The arrival to Almomte is usually around 10 or 11 in the morning. The hours are approximate, due to the stops that are made during the night. The adornments of the step is tradition that they are taken by the old almonteñas, known popularly like “the almonteñas grandmothers”. The way out is nocturnal, it is dotted with bonfires and it is made field through previously determined places, that every seven years constitute the same itinerary. The exorns of the streets are authentic ephemeral cathedrals, executed by local artists to receive the Virgen del Rocío, giving greater solemnity to the transfers. The exorns are an ephemeral architecture based on wood and paper that represent triumphal arches and temples on columns of the most varied architectural styles. – The transfers of the Virgen del Rocío to her village of Almonte have been carried out for centuries, but the tradition of the 7 years is relatively recent, dating from 1949. – Whenever events such as epidemics, wars, droughts, bad harvests or famine occurred in Almonte, the Virgen del Rocío (Virgin of the Rocío) was brought here, where she stayed for the necessary time in the parish of the village, where cults and mass were celebrated, to be returned later to the hermitage of El Rocío. – Tradition tells us to remove the veil, when the first ray of sunlight illuminates the Virgin’s face. At that moment hundreds of trabucos and shotguns fired salvoes in honour of the Virgin. – The last time a transfer was held the Virgin of the Rocío remained in Almonte from August 19, 2012 to May 12, 2013. The first written document about a transfer is in 1607, where the transfer of the Virgin to the village of Almonte is told due to drought, on April 21, 1607. The Virgen del Rocío was moved long before 1607, but today there are no written documents on these transfers. Subsequently the Virgen del Rocío has returned on numerous occasions to Almonte. It is worth mentioning one year, in which it was moved on three occasions. This occurred in 1738, when it was recorded in a document. From Doñana awaiting the much-desired rains that will flood the marsh, greening the forest and quenching the thirst of life. And between looks towards a cloudless sky, comes the sound of autumn to Doñana, which is broadcast by hundreds of geese that will turn into thousands, filling the air with their voices and painting the blue sky with their silhouettes in formation. The geese that like every year have been announcing, always, the arrival of autumn rains. For those who have lived the passage of time in Doñana and have learned to love their landscapes, these birds, which like many others come from the far north, initiate one of the most vibrant seasons of the marsh and fill the heart with a special emotion, that in passion becomes to observe, learn and learn from the rich and diverse winter fauna of Doñana. 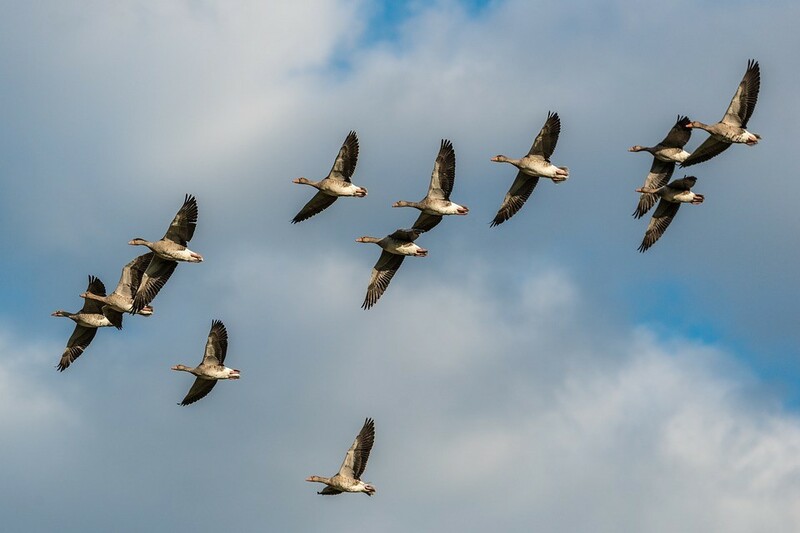 But this year the squawking of the geese and the parpar of the anatidae that always accompany them, have not been accompanied by the rains, not even the cold, rather it seemed an arrival of birds in spring but with the characters changed. These situations of lack of rain and high temperatures in the autumnal months are not new and are even repeated cyclically in the south, although perhaps they are increasingly frequent and intense in terms of dryness and heat. 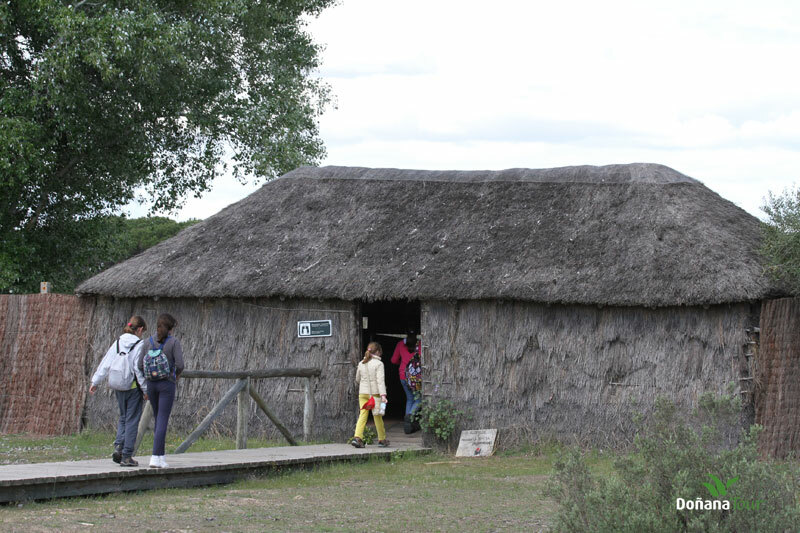 Even so, the marshes of Doñana are the most important wintering place for geese in Europe, each year hosting more than one hundred thousand specimens. 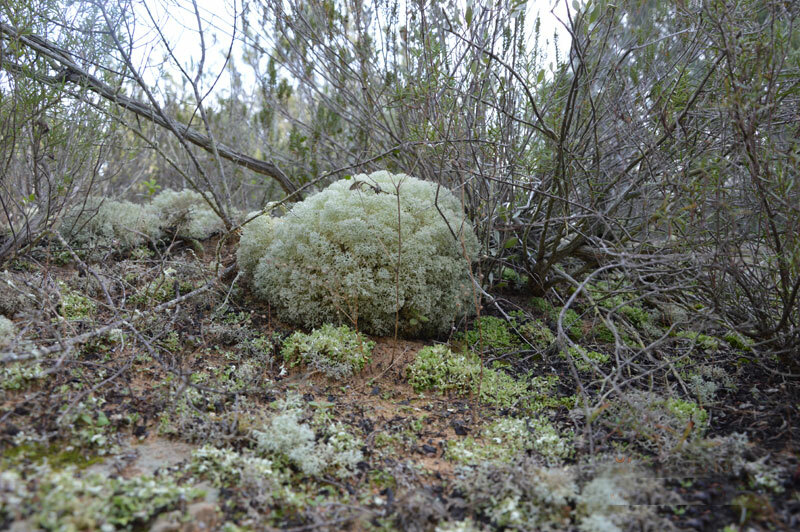 They come mainly from the south of Scandinavia and the Baltic countries, accustomed to wet and flooded areas where they feed on tubers and rhizomes, hence they find in the marshes of Doñana an ideal place to spend the winter that has frozen their northern lands. It is at dawn, when the screaming of the geese is heard among the mists of the marsh in search of their first meal, the rhizome of the castanet, perennial grass, endowed with a deep system of roots, rhizomes and underground tubers. 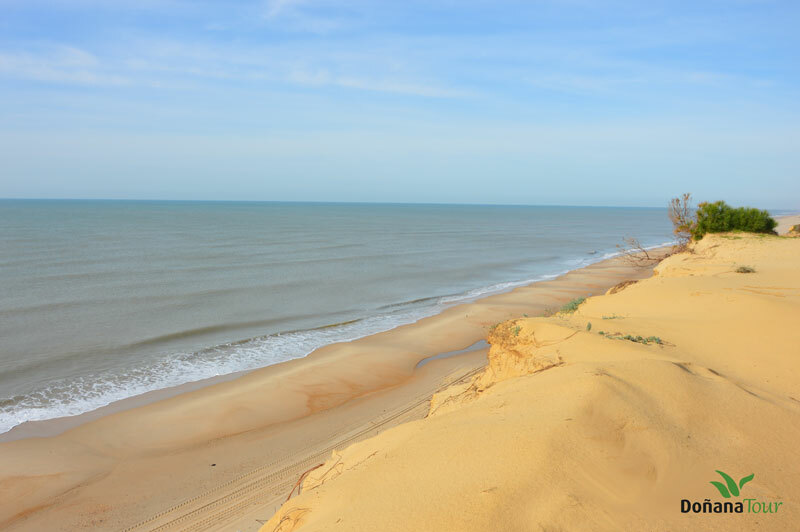 But in order to better digest these foods the geese begin their morning walk in the dunes of Doñana where they swallow sand and pebbles that in their gizzards will serve to crush better the castanet. 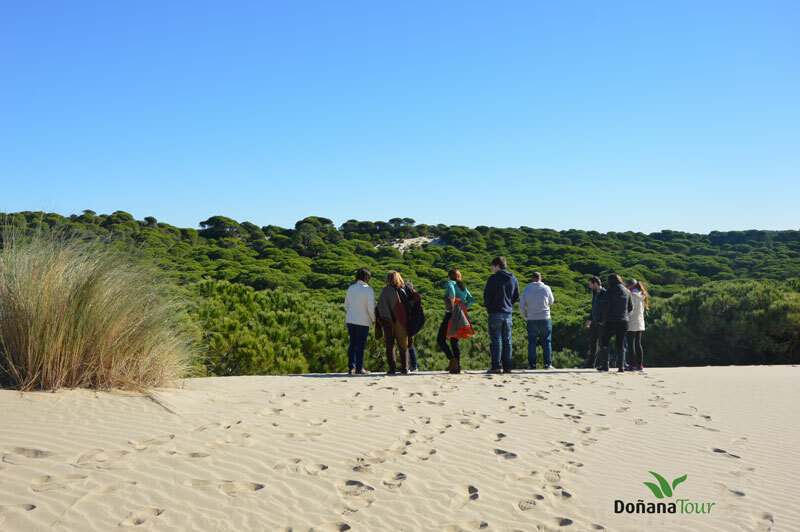 This peculiar custom gives its name, between the complex of mobile dunes, to one of the most emblematic places in Doñana: Cerro de los Ánsares, the ideal place to tell you about the next world! HELLO!! 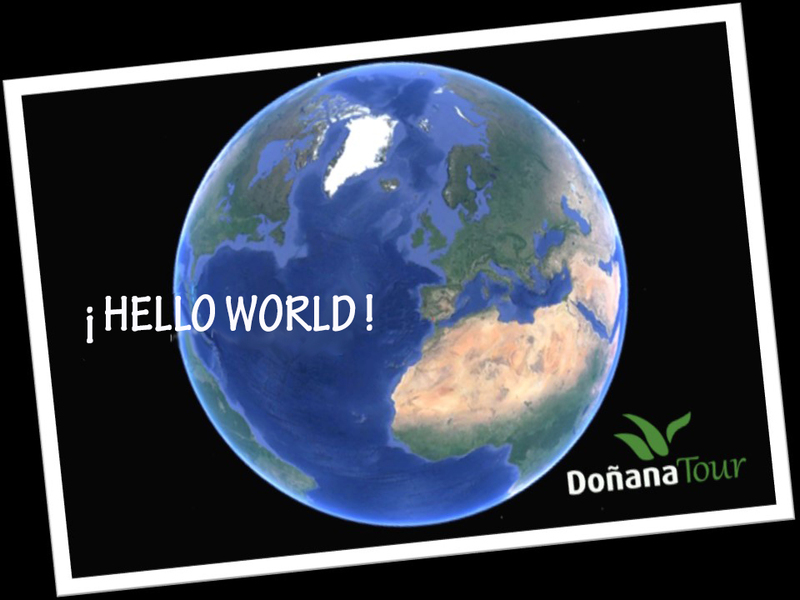 We would like to translate this welcoming or greetings to all the existed languages from our Planet. This is our MOTHER EARTH , common home for mankind and all human beings living here. This presentation try to be a declaration of intentions. We are encouraged by the desire of sharing and involving others who wants to express sensations, emotions, feelings, ideas or thoughts. 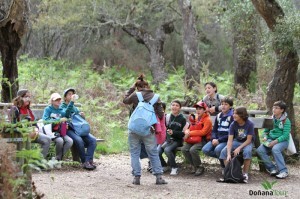 Every reflections about the relation between human beings and their global environment and particularly DOÑANA. Because this page, and embryo of Forum, is born in the heart of the Natural Space of Doñana, unique, diverse, special and privileged place, from which we want to share experiences that have helped us to feel, know, understand and protect this natural place and also to protect Nature in general in all its diverse manifestations. We invite you, therefore, that from the divulgation of news of interest, we are able to establish and link, from tolerance and respect, experiences and opinions that help us grow and mature as sensitive and intelligent beings. People capable of making Our Common Home, The Earth, a place of coexistence, peace, freedom and well-being, sustainable in the present and in a future time. 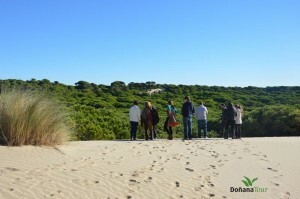 Doñanatour forms part of the Doñana Products Club, in which different companies from the ATENA association present activities related to the natural area of Doñana.